4 Nod if You Were the Last Man Alive. Terra Firma flags. Sky burns electric. Fauna flee for fear. The second coming of Christus is here. 8 new stations of the cross oscillate wildly between bristling electronic noise pyres and sizzling, solemn song-forms. “From Atop This Hill” is a study in the transcendental possibilities of synthesis couched in the form of a mystery play. The jilted narratives just glisten, rich with pulsating electrocycles that alternately coil into instrumental pythons. Form and function fuse in a flux of devotional experimentalism paired with a sort of weird pop. Christus' strangely wrought onomatopoeic lyrics are compelling, wrapped as they are in his classic coldwave croon amid slo-mo motorik surges of minimal wave. Drag thy cross upon yon hill and embrace the passion of the Christus. Christus & The Cosmonaughts May Well Be: The progressive, psychedelic musical excursions of an ever-changing band of performers fronted by yours truly, Scot Solida. A strange and unique hybrid of live jamming and cut-and-paste techniques form the basis of the songs. From space rock to prog rock to blatant experiments in sound, you will find something new in the sonic explorations of Christus And The Cosmonaughts. To understand the reasons for its existence, we must go back nearly a quarter of a century to the turn of the nineteen-eighties, when a pair of singular events occurred which would shake the very foundations of even the strongest psyche. First, I would face the death of my father, who was brutally murdered at the hands of a gunman, and left to die in a desolate field. I will not go into details here, but if you would like to learn of my very personal feelings regarding the matter, consult the track "Famine" from the extended play recording called The Four Whore's Men. I was plunged into despair and madness, and the results were that I would spend far too many of my formative teen years behind the locked doors of one institution or another. It was an embarrassingly predictable response to a tumultuous and unfathomable event. They never caught the murderer who stole my father's life and my sanity. The other event, which occurred at roughly the same time, but necessarily later, was a performance by a skinny Brit on the television. The fellow was Gary Numan, and I was enthralled by the mysterious sounds he and his band were producing. This began my lifelong love affair with synthesizers, which would become a hobby, then a career. Like so many solitary people, I spent the better part of my years seeking out music and art that I deemed to have been as strange and unusual as I myself was becoming. That art usually had something to do with science fiction or other flights of the imagination. I didn't care for the "real" world with any amount of conviction. I also became obsessive about pursuing the art of synthesis, first with my simple monosynths, and later with more elaborate and sophisticated gear. By the mid part of the decade, I was supporting myself as an illustrator, all the while recording my own (admittedly embryonic) music, and eventually wound up working with a brilliant studio owner called David Nichols, who taught me the finer techniques of engineering. Christus & The Cosmonaughts was born during this time, as an excuse to write and sing my lyrics (usually short stories) and to experiment with the fabric of sound. Fast forward to the present: Christus And The Cosmonaughts now happily resides alongside some of my favorite artists on the utterly superb independent record label called Beta-lactam Ring Records, whose head honcho shares my penchant for elaborate and artistic packaging. For the most recent LP, I have been joined by an extraordinary guitairst and bassist who goes by the unlikely name of Har, the ever-stalwart Ant Graham and 54-year-old Nashville session drummer and Colorado resident Wayne Cunningham. As for myself, I am a professional sound designer and writer. If you use a computer for your music, you have probably read any number of my articles in the UK magazine called Computer Music, or the stateside Grooves magazine. You may even have used my sounds in your software synthesizers (I have patched a great number of them), or dragged one of my loops into an arrangement, via the samples I do under the name The Electronic Garden. I have put many of them to use myself. - Progression Magazine's Issue 52 (the first print magazine to review us) gave Christus & The Cosmonaught's "From Atop This Hill" a Total Rating of 12 1/2 (three out of four stars)...! "The effect likens to a trip back to pre-Dark Side of the Moon Pink Floyd land, especially when Har busts out Gilmour-esque blues-from-space soloing on "Nothing to Say"....Solida...keeps to his strengths as a constructor of analog-based textures, as integral a part of the narrative (loosely termed) as the lyrics, sung in a voice resembling the above-mentioned Dave Gilmour..."
"Utilising a whole battery of synths, effects, a host of stringed instruments plus assorted percussion, musical duo Scot Solida and Har, have produced a soaring space-rock epic on "From Atop This Hill"...With sequencers and synths a-plenty, the title track is an electronic delight, a massive wave of sound that rises to the stars, strange vocals and some quite magnificent guitar, adding to the swell before the song slows down into a weightless psychedelic haze...If you are a fan of 70's space-rock such as, Floyd, Tangerine Dream or Manual Gotsching then this is an album you should own, filled as it is with quality music." "From Atop This Hill though, is about as far from cold, calculating precision as you can get; sounding a bit like Pink Floyd and a lot like Pink Dots, this album is a freaky psychedelic space ride...The best example of Solida's mad genius is "Nod If You Were the Last Man Alive," which uses a simple if eerie verse of trippy folk as the launching pad for explorations into everything from blipping ambient to screeching guitar improvisation (performed by Solida's enigmatically-named band-mate, Har)...It takes real expertise to make music this crazy, but you don't have to be familiar with Solida's technical background to enjoy Christus and the Cosmonaughts. In fact, even if do you try to figure out how he does it, the music will short-circuit your rational mind before you get the chance." "From atop of this hill is an enduringly quirky, cosmic and original mix of prog, electronica and pop - offering up an eight track album that nears the hour mark that always remains fresh and varied through out. One would imagine from the projects name and the sound on offer we're dealing aleast with a 5 piece band, but it's played by just two people; Scot Solida handling the lion share of instrumentation from: vocals, various guitars, mandolin, Appalachian Mountain Dulcimer, bells, chimes, drums and percussion, Hammond organ and various synthesizers. With Har handling electric guitars, bass, chapman stick and ebow...they manage to balance the mixes of styles nicely- so you don't know what you'll get next be it: prog, hypnotic synth scapes, electronic often jerky beat craft, electro pop , or a mix of them all with some other neat other genre touches too like dips into folk and funk...mean and moody soundscapes, latter-day Genesis gone to the dark side with weird edges, which mid-way goes into a nice chugging synth and guitar march that also show the first traces of the virtuous but not indulgent guitar soloing- that goes from blues, emotional, to rocking to odd. Surviving the fanatics feels like an more inventive & quirky take on OMD 80's synth pop, with some beautiful ambient guitar undersoloing and neat electronica elements...A very satisfying and varied album that welcomes replays easily, embossed though out with well played and thought out instrumental colours and shades." "Haunting you with a caustic yet melodic vocal, Christus & the Cosmonaughts are a more spacey Pink Floyd with defiant acid rock jams and similarly intelligent electro pop hits. Think Genesis P-Orridge with a dash of Pink Floyd with a bit of the more eerie The Orb songs, and of course Psychic TV." "All very brain massaging and image inducing, and there are some intense moments to shake things up a bit. There's so much happening here it's impossible to adequately describe, but it's all stitched together in a way that flows very smoothly...Overall the album features an excellent mixture of space atmospherics, sound constructions and song, drawing on a variety of space rock and progressive influences..."
"This, the band's second full-length release, is an intriguing excursion into the possibilities of modern electronics merging with smart melodic pop. Some of the tracks are rather straightforward and somewhat accessible...while other compositions spin like explorations into space travel. In many ways, From Atop This Hill is reminiscent of some of the better British progressive bands from the 1970s (particularly Steve Hillage at times)...but the sound quality is far superior. Scot has a great understated vocal style that really makes these tunes click. Mentally absorbing and surprisingly resilient, This Hill is an odd, smooth ride that gets better with repeated spins..."
"Scot Solida (vocals, electronics, etc). And Har (guitar, bass, etc). By duo, Christus & The Cosmonaughts. Artwork photos, as well as large amounts of credit from a vintage synths, Shin Se geeks and Metal brother duo, it is. And autointoxication AVAN-Pop to make, but, unexpectedly pop songs because of a surprise. The weird part is strange, but unexpectedly outgoing! ? ?" "Scot Solida's spacey electronics and guitars contributed by a musician named Har form much of the backbone of the album...an intriguing album with impeccable production and well worth the effort of settling in to unravel its mysteries." 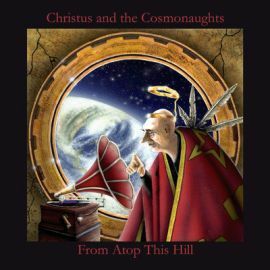 "Christus and the Cosmonaughts define their music as Progressive / Experimental / Psychedelic, and there couldn't be a better definition...extremely talented and multifaceted musicians...'From Atop This Hill' proves to be a wrapping experience, covering a wide spectrum of different coloured notes and lines. It sometimes feels as if the entire record were meant to be drawn out while listening to it, in an automatic and visceral way. An interesting, bizarre and delicious experience."